How much money could you save after just one year of utilizing a Product Recovery Pigging System? With so much focus placed on safety and production, it’s no surprise that many companies cannot place an exact dollar figure on waste generated from using antiquated change-over techniques in their facilities. 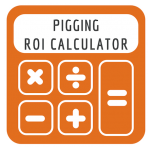 Inline’s Pigging ROI Calculator below can quickly and easily show you the total cost savings after one year of utilizing a Product Recovery Pigging System. *** Note that pigging recovers 99.7% of everything in the pipeline. Inline services can assist you and/or your maintenance team in assessing if a product recovery pigging system makes sense for your particular project. Contact us today Toll Free: 888.973.0079 Local: 281.401.8142.